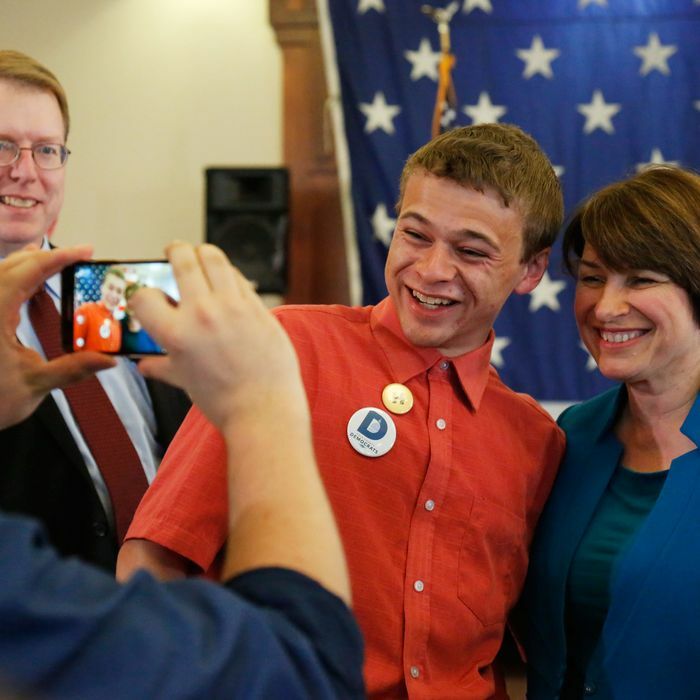 Amy Klobuchar is among the first 2020 possibilities to perform the rituals Iowans require of candidates, which include defending their first-in-the-nation status. With arguments still swirling about how and why Democrats lost the 2016 presidential contest, and well before the midterm election cycle gets seriously underway, the first stirrings of the 2020 presidential-nominating process have begun in Iowa. Minnesota senator Amy Klobuchar appeared at county Democratic fundraisers in Des Moines and Cedar Rapids over the weekend. She did not acknowledge any White House fever, and as the senator from a neighboring state (she joked in Des Moines that she could see Iowa from her front porch) she can dip a toe into Iowa politics without raising too many eyebrows. But make no mistake, the complex process of “paying dues” in Iowa in order to gain an advantage in a theoretical run has begun. “It’s never too early, unfortunately,” said Tom Vilsack, a Democratic former Iowa governor and agriculture secretary. He advised that a smart presidential candidate will spend less time in Des Moines and more time in smaller, rural areas getting to know the state’s legislative and gubernatorial candidates. That’s right: If you want Iowa’s love, you better spend some time raising money for local candidates, and, better yet, send some paid staff into the state to help them with their campaigns. Making sure the state party has the best tools for politicking money can buy is helpful, too. In what could be a wide-open 2020 race with many candidates, these are the sort of investments that can pay off early in Iowa. But they are hardly fail-safe: The 2016 candidate who followed the rulebook most faithfully, Martin O’Malley, wound up with a booming one-half of one percent in the official tally of the 2016 caucuses. Candidates with larger-than-life profiles or followings, like Hillary Clinton and Bernie Sanders, can blot out the sky and make all that trudging around the Hawkeye State attending potlucks a waste of time (this also happened in 2008 to John Edwards, who barely left Iowa after finishing second in the caucuses four years earlier, but found himself eclipsed by the Obama political supernova). If, say, Elizabeth Warren runs in 2020, she might get to skip all the dues-paying, too. But for the less celebrated prospects, what Klobuchar is doing will be essential unless they want to pursue one of those rarely successful strategies of skipping the Iowa caucuses entirely. Meanwhile, Iowa Democratic activists are less focused at the moment on potential 2020 candidates than on the perennial struggle to defend their first-in-the-nation-caucus status. The particular source of anxiety for them at present is the Unity Reform Commission created at the 2016 Democratic Convention that was supposed to address the grievances with the nominating process expressed by Bernie Sanders and his forces. This commission just held its first meetings over the weekend, and it does not appear that the Iowa/New Hampshire duopoly over the beginning of the nomination process is under any kind of direct threat. But there is and will continue to be talk about Iowa’s extremely arcane procedures for casting, tallying, and reporting the caucus results, which came under fire from the People of the Bern last year. And as a sign of how paranoid Iowans are about their status, the Des Moines Register reports they fear any “reforms” that make their caucuses more like primaries could freak out New Hampshire, triggering a competition that could result in a sort of political murder-suicide for the two states. In reality, the main controversies before the reform commission will almost certainly be over superdelegates (not a particular concern to Iowans) and perhaps the rules whereby some state parties discourage participation by independents (not a big problem in Iowa, which allows indies to reregister as partisans at the caucuses themselves). But there is no threat to Iowa’s status too small to be taken seriously by political people there. So in addition to consuming potluck meals and helping Iowans raise money and staff campaigns, presidential aspirants will also be expected to loudly identify with the holy cause of the caucuses just in case someone challenges it for real. It’s worked well for Iowa up until now.